So, is it chilli, chili or chile? ....I say chill! It all validly points to the hot pepper vegetable that causes beads of sweat to pour down our temples. In American English, however, 'chili' largely refers to the stew, chili con carne (Source: Chile, Chili, or Chilli? What's the Correct Spelling?). You know the saying - When in Rome, do as the Romans do. 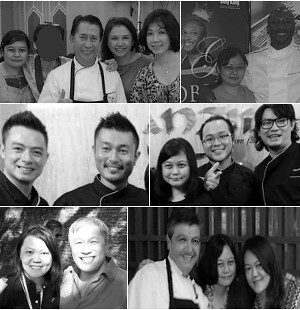 Malaysians generally love a little spiciness in their food. Many restaurants serving rice with meat and vegetable dishes include a small plate of sliced chilli to go along with the meal. Sambal is another way Malaysians enjoy their chilli. This sauce is traditionally made by pounding chilli together with other ingredients such as onions, garlic and ginger, into a rough paste. The flavour is further enhanced with the addition of shrimp paste, fish sauce or vinegar. It is usually seasoned with salt or sugar and a squeeze of lime juice at the end. It can be eaten raw or cooked. When it comes to sambal, the varieties are endless! We enjoy sambal in many ways. It typically accompanies coconut rice (nasi lemak) or plain rice which is served with fried meat, seafood or vegetables, and fresh greens . It is also commonly paired with fried rice and noodles. We sometimes do away with cutlery when having sambal with rice. Eating with hand is the way to go for a tastier experience. 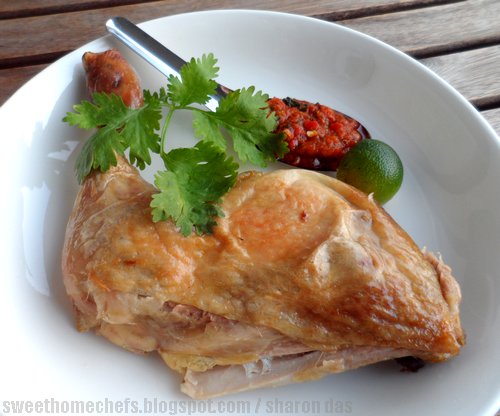 I decided to make my own after enjoying a heap with ayam penyet (smashed chicken) at a local food court the other day. The chicken is called smashed chicken for obvious reasons. All the easier to eat when the meat has been flattened apart. My version of sambal is a quickie, also served with smashed chicken but in the simplest sense without the spices and the work. A great take to satisfy impromptu cravings. 1) Rub chicken with salt, pepper and grated ginger. 2) Bake in oven, on a foiled baking tray, for about 50 minutes at 180C. 3) Once cooked, place chicken on a clean cutting board and smash once or twice using a cleaver. 1) Heat oil in pan. 2) Stir-fry blended ingredients for a minute or two. Then, add the flavoured dried chilli paste. Season with salt, if necessary. 3) Continue stirring and cooking for 2-3 minutes. That's all there is to it. 4) Squeeze calamondin juice over the chilli just before serving. To eat : Serve smashed chicken with rice along with sambal and some fresh greens like lettuce, cucumber slices or coriander. Smashed And Ready To Be Eaten! 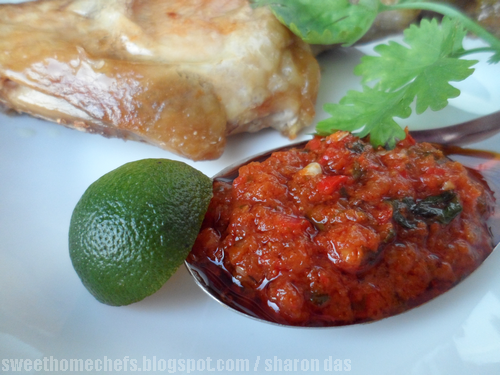 Your sambal sauce looks so good! I should make my own too instead of buying from our local supermarkets. I think it's ideal food for my partner. He likes very hot food. I will try to make it for him. A wonderful combination! 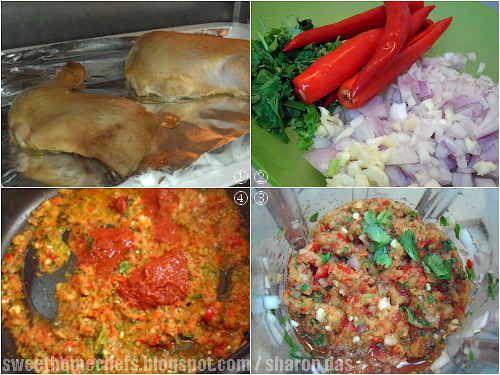 Love the look of your sambal...my mouth's watering!! I'm equally confused too whenever my spelling check prompt me to correct my chillies to chilies... aiya. 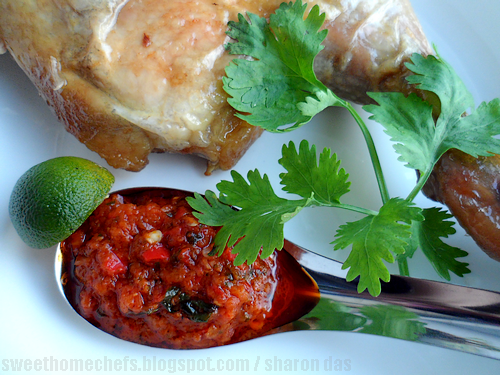 Smashed chicken and sambal...I can use some of that just about now. Looks great!